Utkarsh Rajawat (Suresh) and Momo Nakamura (Ilana). Photo by Harvey Levine. You don’t have to know about origami to appreciate Rajiv Joseph’s play Animals out of Paper, on view at Silver Spring Stage. But it helps. There’s mystery to how origami is created, but simply put, it is the art of paper folding, often associated with Japanese culture but today an inclusive term of all folding, regardless of origins. Origami transforms a flat sheet square of paper into a finished sculpture through folding and sculpting techniques—ideally without cuts, glue, or markings. Director Butts has played up the highs and lows of Joseph’s intimate, yet highly emotional, play, as well as the interface between human relationships and art. 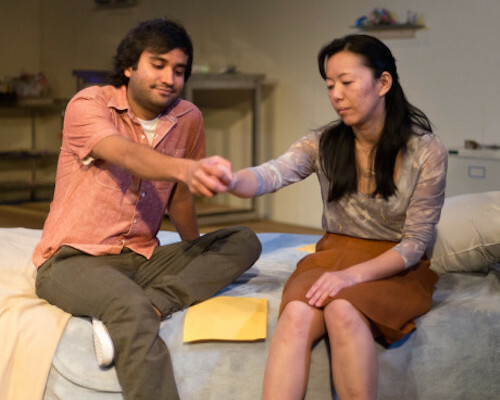 If origami is the “pretext” for the play, human relationships give it its glue. The three-person work is full of whimsy and surprises. One of the latter is that a near-stranger who rings your buzzer one rainy day turns out to be not only not dangerous but also a beacon of hope. Saying a work of art is “different” is almost a cliché. Yet, in the case of Animals out of Paper, it’s true. It’s hard to think of another play that centers on origami. But of course, there’s more to it—as a world-renowned origami artist much more adept at folding paper than she is at life tries to overcome the devastating losses of divorce and a missing pet as well as creative block. The two men who enter Ilana’s life have experienced losses of their own: Andy, a teacher and active member of the Origami Society, clings to small memories he enters into a book of blessings in place of truly meaningful joy. His student, Suresh, a prodigy origami artist, lost his mother in a hit-and-run accident. He tries to compensate through toughness and vulgarity that don’t suit him. According to director Brandon Rashid Butts, origami represents the constant motion and transition human beings, who are never static, undergo. Certainly, the play is intriguing and endearing. What is frustrating is the lack of “closure.” Ilana has regained the ability to fold she had lost some months ago, but we’re not told what happens with the two men she seems interested in. Has she really learned anything about relationships, beyond her tentative ties to both men? Will she choose one of these, or neither? What will happen to the bond between them if she chooses one or the other? Ilana, the artist, is a bitter woman, who may have been that way before her losses—and Momo Nakamura captures both that and her energetic talent. Strongest in the cast is Rob Gorman, making his DC-area debut, as Andy. He is totally convincing as the man to whom nothing very exciting has happened, but who has not lost his kindness, open-heartedness, and openness. Utkarsh Rajawat, as Suresh, is passionate and thoughtful–whether cursing, acting “cool,” rapping, being a neat freak, or romancing Ilana (with sincerity and not the least self-consciousness about age or status differences). Shelton Hall and Paris Brown are the set designers, incorporating what appear to be hundreds of little origami figures suspended from the ceiling and elsewhere. Loredana Calin and Meghan O’Brien are the actual origami artists. Hall is also he maser carpenter, and Nick Batselos is the set painter. Star Johnson is the producer and properties manager. Mika Eubanks is he costume designer. Running Time: One hour and 55 minutes, with a 15-minute intermission. Advisory: For ages 12 and over. Some language. Animals out of Paper continues through March 12, 2016 at Silver Spring Stage, Woodmoor Shopping Center, 10145 Colesville Road, Silver Spring, MD 20901. For tickets and information, call (301) 593-6036 or click here.